This weeks Blog of The Week refers to “Over training syndrome” and the dangers of doing too much. Take a read of this blog from Norris Health on how to manage “OTS”. To be effective, training has to be progressive. This means that your body will change (adapt) to the stresses that an exercise places on it (overload). Take as an example an arm curl action in the gym. If you lifted 5kg, that is probably less than you would lift in day to day living, so it is not overloading the body. If you lifted 20kg, that may be greater than you would usually use so it challenges the body and causes microscopic damage within your muscles. You have overloaded the muscle, and so with rest the muscle will respond by adapting and growing stronger. After a few training sessions, the 20kg weight is no longer such a challenge because your muscle is now stronger, so unless you progress the exercise and increase the weight your muscle will not strengthen further. The overload will depend on the type of exercise you are performing. If it is endurance (aerobic) exercise you may have to progress the distance you run, for flexibility exercise the range of motion, and for balance and coordination the complexity of the movement. The overload has changed in each case, but the concept of exercise progression remains the same. As you challenge your body, the tissues react by overcompensating and becoming better than before. 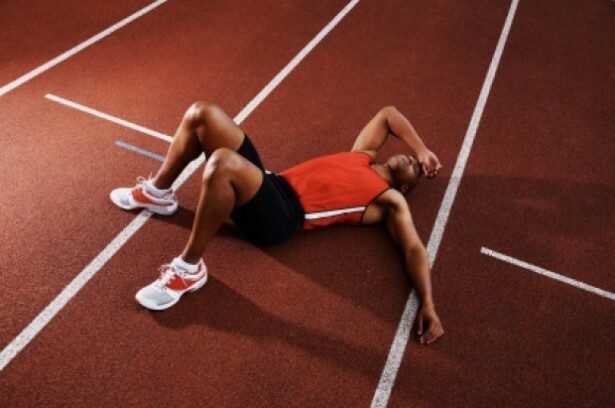 Some fatigue immediately after exercise is desirable and this type ofacute fatigue ultimately leads to an increase in performance as the body adapts. After weight training for example, muscles may be sore and less able to perform, but with time they will strengthen. 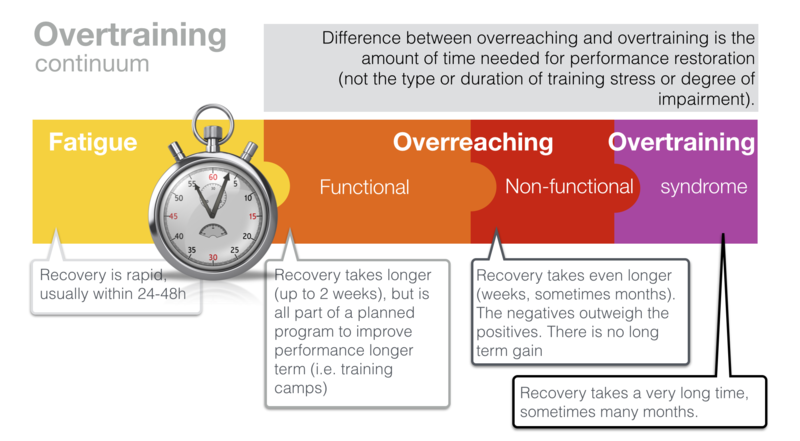 However, if the training volume (sets, reps, type of exercise) is too great, or the recovery period between training bouts too brief, athletes will overreach giving a more noticeable but still temporary reduction in performance. This is actually desirable, because it shows that the body is being worked hard, and optimal gains are likely. Where overreaching (OR) is marked, after a particularly hard workout for example, stagnation will result in a brief performance reduction, but providing adequate rest / recovery is given the effect is positive. Overreaching of this type is termed functional OR. Continuing the increase in training intensity without allowing recovery will lead to a reduction in performance called non-functional OR. We can define a short term performance reduction as one which allows you to recover within a 2-week period (Lehmann et al 1999). If recovery is not adequate and training continues, you will progress is to overtraining. Recovery in this case may take months or in extreme cases years (Meeusen et al 2006). Overtraining syndrome (OTS) also called Unexplained Underperformance Syndrome (Budgett et al 2000), or simply burnout occurs when the body is subjected to stresses beyond its capacity to adapt positively. Lack of adaptation to training leads in turn to a reduction in exercise performance and a number of important potential health concerns. The symptoms of OTS are initially similar to those of hard training, such as muscle aching, and fatigue. However the experienced therapist or personal trainer (PT) can detect when these changes are greater than normal. The answer here as a user is to listen to your body, and as a PT to monitor your client closely. Several physiological effects are thought to underlie OTS, including autonomic nervous system changes, alteration in endocrine (hormone) response, suppression of immune function and variation in brain neurotransmitters (nerve chemicals) (Wilmore et al 2011). Alteration in sympathetic nervous system drive is seen in athletes who emphasise high intensity resistance training giving increased heart rate, blood pressure, and basal metabolic rate (BMR), loss of appetite and decreased body mass (table 1). Endurance athletes tend to present with performance changes initially and alteration in mood state secondly, while power athletes tend to exhibit mood changes first (Budgett et al 2000), and may often simply appear ‘off their game’. One of the adaptations to normal training is a change in the hypothalamic pituitary axis or HPA, an area in the centre of the brain which secretes hormones. There is an increase in the ratio between the two hormones ACTH and Cortisol immediately following a workout. In OTS there is an alteration in the rate at which ACTH rises following exercise and this has been used as a blood test to identify non-functional OR and OTS. Using two exercise bout tests Meeusen et al (2004) were able to demonstrate large increases in hormonal release following the first exercise bout but suppression following the second. Time to fatigue tests which are specific to an athletes sport have also been used to detect OTS (Halson and Jeukendrup 2004). Typically athletes suffering from OTS are able to begin an exercise session performing normally, but then suffer from an unexplained performance drop. Mood state questionnaires are very useful in the identification of OTS as affective states (temporary emotional changes) which are negative characterize the condition. Questionnaires such as the recovery-stress questionnaire (RestQ-Sport) have been used successfully. This is a 76-item questionnaire which assesses the physical and mental impact of training (Kallus 2001). Heart rate variability (HRV) has also been used as an assessment tool of OR. HRV increases with heightened parasympathetic tone and has been shown to be significantly elevated following chronic training (Meeusen et al 2006). Ideally clients should be tracked throughout their training to identify a baseline of physical and emotional level. Any change from this baseline quickly becomes apparent to give warning of OR or OTS development. One of the most frequently reported physical changes in an increase in upper respiratory tract (URT) infections following hard training, presenting as cough, sore throat, wheezing and runny nose. A 2 week period of intense training has been shown to reduce bacterial defense response by 20% (Robson et al 1999) and a 1 week intense programme to lower T-cell count (Lancaster et al 2004). The initial management OTS is dependent on identifying OR before the condition progresses further. This is made easier by keeping a training log to record performance. Any trends in performance reduction can be readily recognized. Where OR is suspected it is vital that training volume and or intensity be reduced, and in more severe cases total rest may be called for over a period of many weeks. Prevention focuses on periodisation of training to vary training variables including frequency, intensity, time and type (FITT). There is an inverse relationship between training volume (how much) and training intensity (how hard). When intensity reduces, training volume must increase to give the same training effect. High intensity, low volume training will increase strength and power, but high volume low intensity is more suitable for aerobic capacity. Clearly a balance must exist between the two, and monitoring a subjects response to training should give an indication as to whether you are getting these variables right. High quality diet and adequate sleep play a pivotal role in exercise recovery and the prevention of OTS, but are often areas which subjects overlook. Similarly changes in personal circumstances and employment may impact on performance and should be addressed.